Eat Like a Roman (with a Roman) is a contribution to my Italian Wine Food Travel Blogging group. This month we are focusing on Lazio, so it made sense to finally get my posts rolling on my recent trip to Rome. Read what my fellow bloggers are sharing about Lazio after my post. Eat like a Roman sounds so cliché, right? If you are in Rome you’re at least eating in the company of locals. But, what about actually being welcomed into their home for a home-cooked traditional meal? It’s a concept that certainly falls under the category of unusual things to do in Rome, given that you can’t just knock on doors and invite yourself to the dinner table. 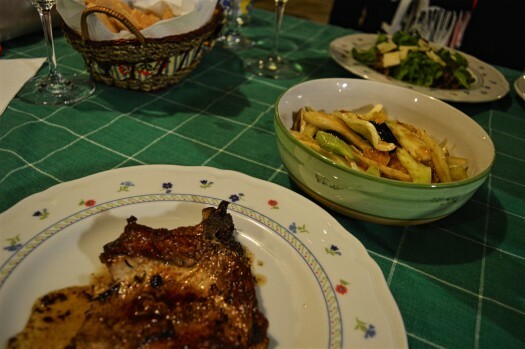 On my recent trip to Rome I gave it a go (not the knocking on doors part, but a pre-planned meal), indulging in a ginormous Roman feast at the home of a local chef / sommelier. Oh, it was delish. How did we get to eat like a Roman (with a Roman)? My pals from the Italy travel site Browsing Italy introduced me to this new dining concept by a company called BonAppetour. It was developed by a group of Singapore-based wanderlusters who wanted to create a unique on-the-road experience through a social platform. BonAppetour connects travelers with locals to share a meal, conversation, and culture. Does it get much more soul-satisfying than that? 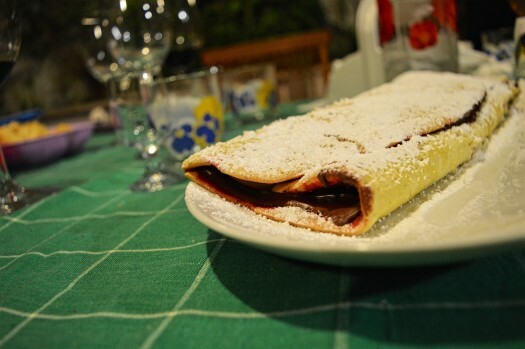 A most perfect Roman dessert. 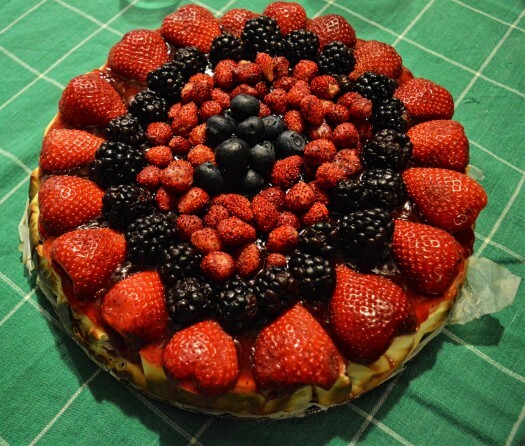 All those fresh, delicious berries – and, the cheesecake and crust weren’t bad either! I booked our meal a couple months in advance. 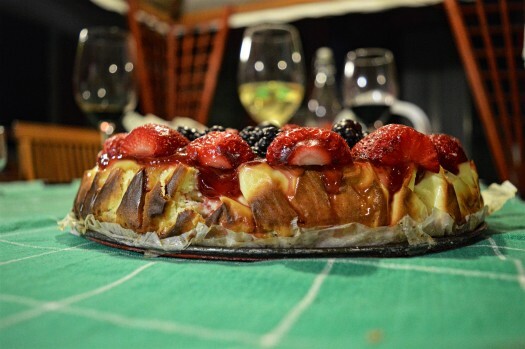 The BonAppetour site is very simple with a huge array of dining options – from traditional to the not-so-traditional – one host in Rome offers a Mexican fiesta. It’s been nearly a year since my last trip to the States, so I was tempted! I was immediately taken by Alessandro’s dining experience. He is a chef and sommelier so the meal promised wine pairings with the local fare. Sold. He gave us a list of menu items and we were to select one item per course. Admittedly, I accidentally told my travel pal that we got to pick one each thinking we could try different things. Alessandro was kind enough to make it all since it was my friend’s first time in Italy and my first time using BonAppetour. Alessandro’s location is near to Vatican City, which was perfect as we were staying in the equally close Prati neighborhood. Upon arrival we were greeted by our new chef friend and his lovely girlfriend (and sous chef), Elena. The weather was warm so they had set up a beautiful table on the patio. 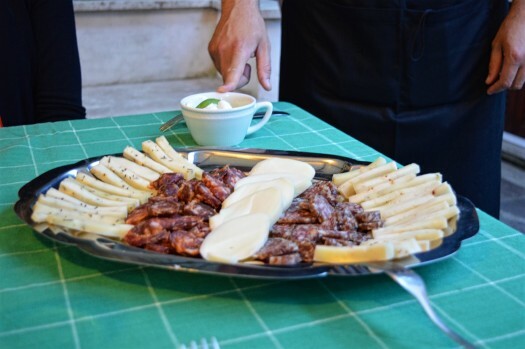 We started with greetings and introductions over a meat and cheese aperitivo spread with a glass of sparkling wine. We were afraid we would be too full for the other four courses! 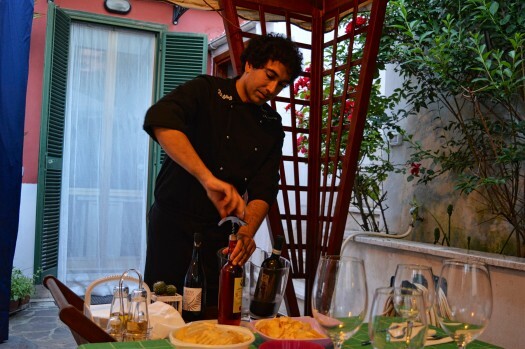 Our gracious host Alessandro is both a chef and sommelier. He welcomes people into his home ristorante and will also travel to clients for a personalized in-home dining experience. Bruschetta paired with Five Roses, Leone de Castris 2014 (Puglia), Negroamaro (90%), Malvasia Nera (10%). Fun fact: The first rosé bottled in Italy. Crostini Romani is made of anchovies and provola (provolone) toasted on bread. 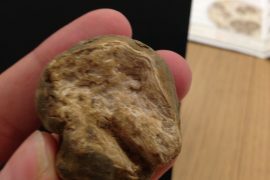 It was paired with Feudi di San Gregorio Falanghina del Sannio 2014 (Campania), 100% Falanghina. 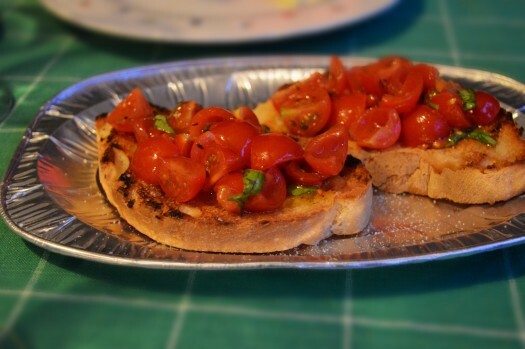 Bruschetta is certainly one of the most traditonal antipasti in Rome. And, biting into these fresh and tasty pieces made it clear why. 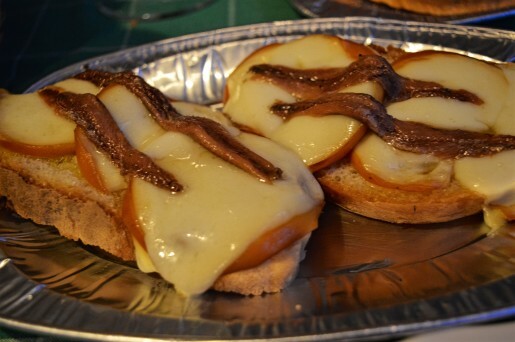 Crostini with anchovies and melted provola are probably less popular due to the heft of the anchovy. I loved it and the white wine stood up to it perfectly. 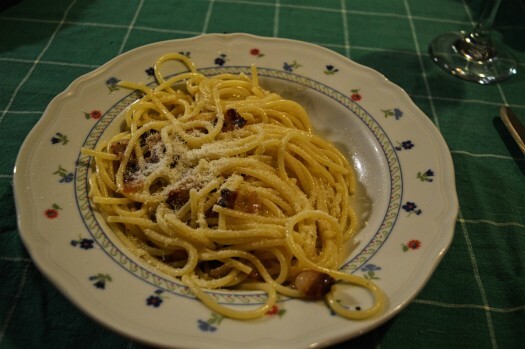 Spaghetti alla Gricia is a simple traditional Roman pasta dish of spaghetti, pecorino romano, pancetta, and olive oil. 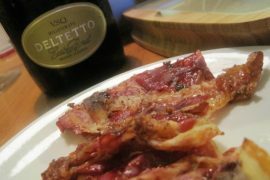 We got a treat because Alessandro used the more decedent guanciale (pork cheeks) in lieu of pancetta. This paired with the Feudi di San Gregorio Falanghina del Sannio. 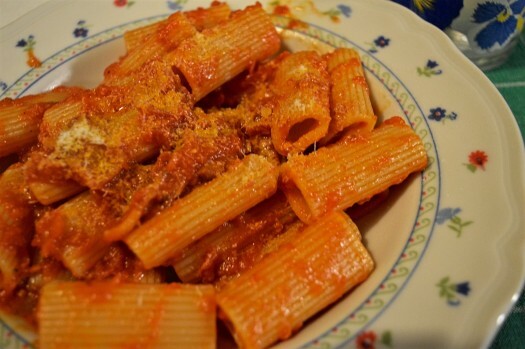 Rigatoni all’Amatriciana, like Spaghetti alla Gricia this is also a common pasta dish in Rome. I love me some spice so I had to go with the Amatriciana because of the heat. The sauce is made with pancetta, tomatoes, and chili pepper. Of course, we got lucky with that more traditional guanciale instead of pancetta (not that there is anything wrong with pancetta!) Paired with Five Roses, Leone de Castris 2014. We had two traditional, simple secondi with two sides: Slices of beef with arugula and cheese. Pork steak in red wine. Served with sautéed beets and a fennel salad with oranges. The wine pairing for both was Atina Cabernet Sauvignon, Il Podere del Falco 2010 (Lazio). 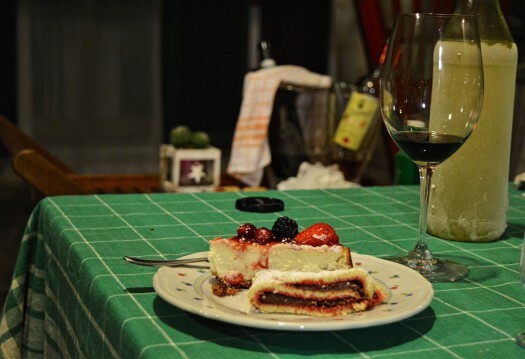 It was fruity and elegant – I suspect my first noteworthy taste of a wine from Lazio. Sweet salami with hazelnut cream; I live in the land of hazelnuts, so when I saw this on the menu I simply had to have it. It was amazing. In Italy you know you have made friends when the limoncello makes an appearance. Homemade, naturally! I had to get a shot before we cut into the sweet salami and hazelnut cream. It’s so pretty both ways! The whole experience was wonderful. We had an opportunity to get to know some locals who are excited to not only share their culture, but learn about others. We felt like old friends by the time we went home. Sadly we didn’t have a refrigerator at our B&B or we would have gladly taken some of the leftover dolce they offered us! BonAppetour operates all over the world with a focus in Europe and a lot of options around Italy. I look forward to trying more dining experiences like these. We’ve hosted winemaker dinners and tasting programs for our wine tour clients, so I might just look into adding Girl’s Gotta Drink as a host! If you are interested in giving it a try email me and I can send you a credit for 23 euros off your first experience. And, if you find yourself in Rome you simply must visit Alessandro and Elena. They also rent a holiday home near St. Peter’s. Check out their meal options, including fish and barbecue dinners. Stay tuned for more of my Rome adventures by subscribing in the upper right. And, drop us a note with your favorite unusual things to do in Rome! Delish! Love this post 🙂 The entire experience really sounds w!onderful, Valerie! It was! Thanks, Ishita!! Def try it next time you are in italy! Wow! I want that experience! How terrific! Sounds like quite the meal and experience. Cool concept! It was so fun! Cheers! O-M-G…I must do this when I travel to Rome Valerie! It sounds amazing and looks amazing. and is right up my alley! It was one of the coolest things I’ve done, Martin! 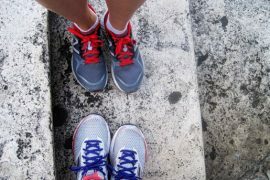 For my friend, being her first trip to Italy, it was a definite highlight. Thanks for reading! WOW! BonAppetour sounds fantastic and I’m already eyeballing the plethora of dining options/cities on their website. Thank you for sharing this! Enjoy – and, thanks for reading!